headed towards the East Coast of the United States, the Google Crisis Response team has assembled a collection of map data to help you keep track of the storm. From this map, you’re able to get most recent hurricane-related information from such sources as NOAA’s National Hurricane Center and FEMA. To provide feedback or comments on the map, or if you’re aware of map layers or other datasets that you would like to see included on our maps, please submit them for our consideration at google.org/crisismap. We’ll continue to update the Crisis Response website with other valuable resources on Hurricane Irene and relevant preparedness tips. To view the projected and historical path of Hurricane Irene in Google Earth you can visit the Google Earth Gallery or download the KML file. We hope these tools help keep you and organizations better informed about diaster preparedness. 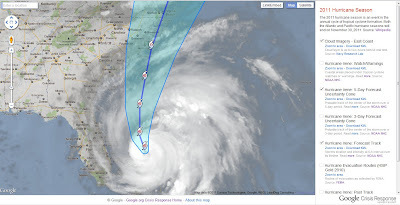 With Hurricane Irene headed towards the East Coast of the United States, the Google Crisis Response team has assembled a collection of map data to help you keep track of the storm. From this map, you’re able to get most recent hurricane-related information from such sources as NOAA’s National Hurricane Center and FEMA.